Wow - stunning work Colleen. I want to steal that gorgeous ribbon!!!! Love your cards! 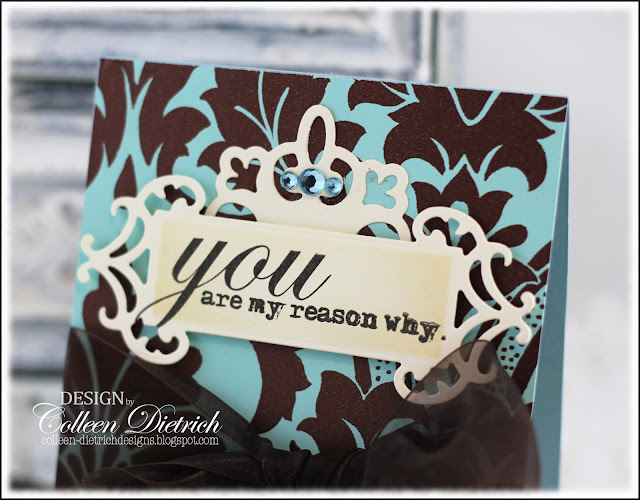 Colleen, your damask cards are simply amazing! 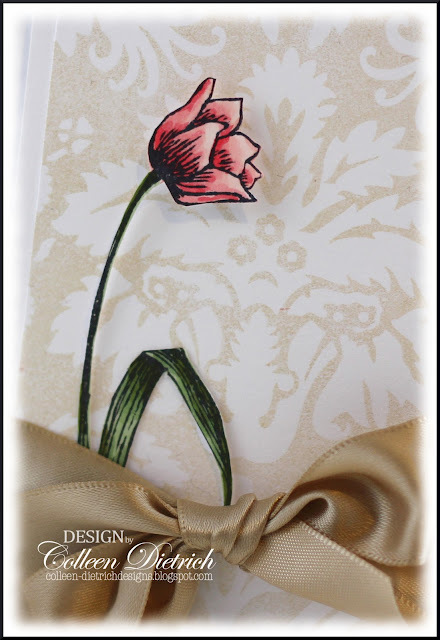 I truly love the elegance of the single tulip!! Gorgeous! Gorgeous card Colleen! So sophisticated - you do this so well! And, congrats on your hm card - I knew that rooster was a winner!! These are both so stunning! I just love the color combinations you used. The elegance of both cards is breathtaking. Col---these cards are GORGEOUS! I love them both--but I LOOOOOOOOOOOVE that first one! The pop of color--the ribbon--the white space! AMAZING:) BEAUTIFULLY done! I agree with Savannah! Plus the little addition with the pearls! But, oh my, that bow looks like it was made to go with the card! The second card is great too esp the colors but I think I prefer the softer tulip card. Great job as always. Oh, and congrats on the card! 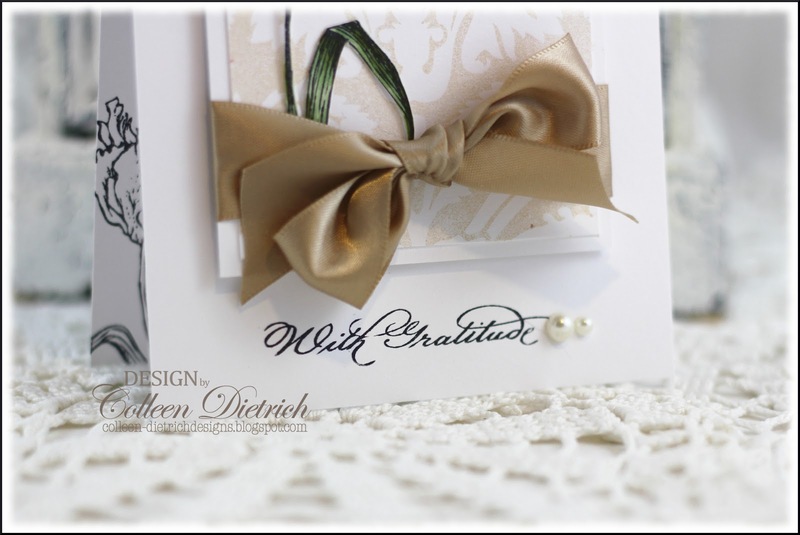 Looove the first card - so classy adn elegant. Great colour combo on the second. Look at you getting all elegant and gorgeous! That first card is A.MAZ.ING!!! Fabulous creations!! Beautiful cards! Love that the tulip-looks like its ready to just jump off the card. Such BEAUTIFUL cards!! Don't feel bad you'er not the only one who hasn't had time to play with the challenges yet!! THANKS for sharing and have a FABULOUS WEEK!! WOW....both cards are wonderful but the first one is wow. Absolutely STUNNING cards Colleen! The first one definitely looks like a WINNER to me! Both of your cards are outstanding, Colleen! Wow! I love the first because it is a work of beauty for sure. I LOVE the color combo in the second...it's so bold. 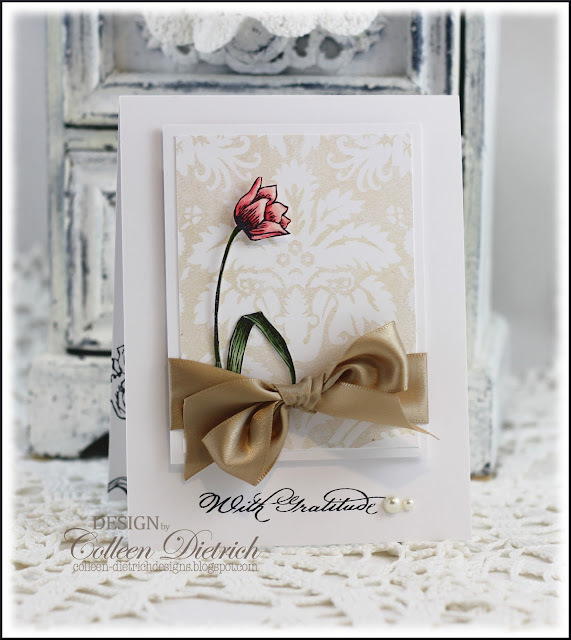 Beautiful cards - I especially love the wheat background and the single tulip. Gift wrap ... love it!! Really gorgeous cards Colleen!! ..I smiled when I read about the Technique Tuesday Stamp ...everytime I use it and I must say I use it quite often , I have wondered If I should mention in my post about the shaky look of the stamp! Simply beautiful, Colleen. Love how you showcased that single stemed flower. Both of these damask cards are just beautiful, Colleen! I love the colors, the patterns, the designs, the embellishments--just everything about both of these! So elegant and clean and really, just perfect. You rocked the damask on both of these, my friend!! Loving that tulip...both cards are beautiful with yummy ribbons. Congrats on the honorable mention...gives you a good feeling, doesn't it? BOTH are GORGEOUS! LOVE the bows and ribbons on BOTH! 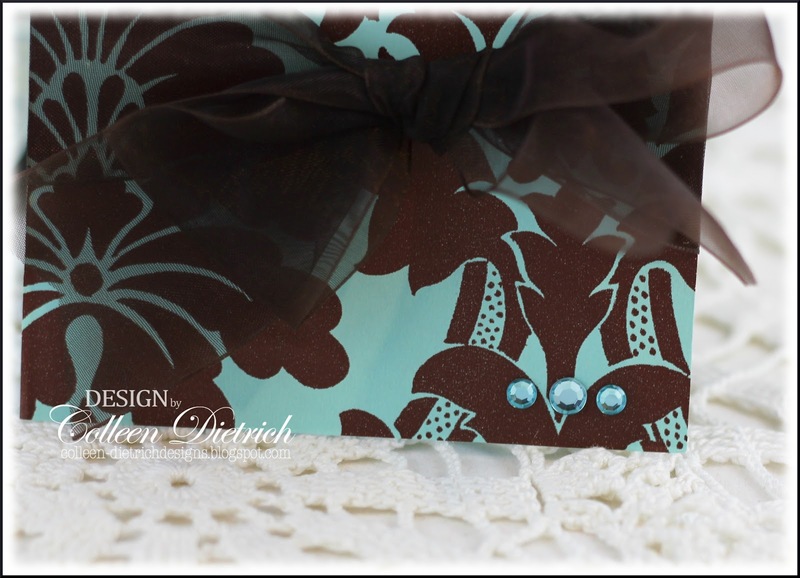 LOVE the damask on the first and the gift wrap on the second. Congrats on the honorable mention! 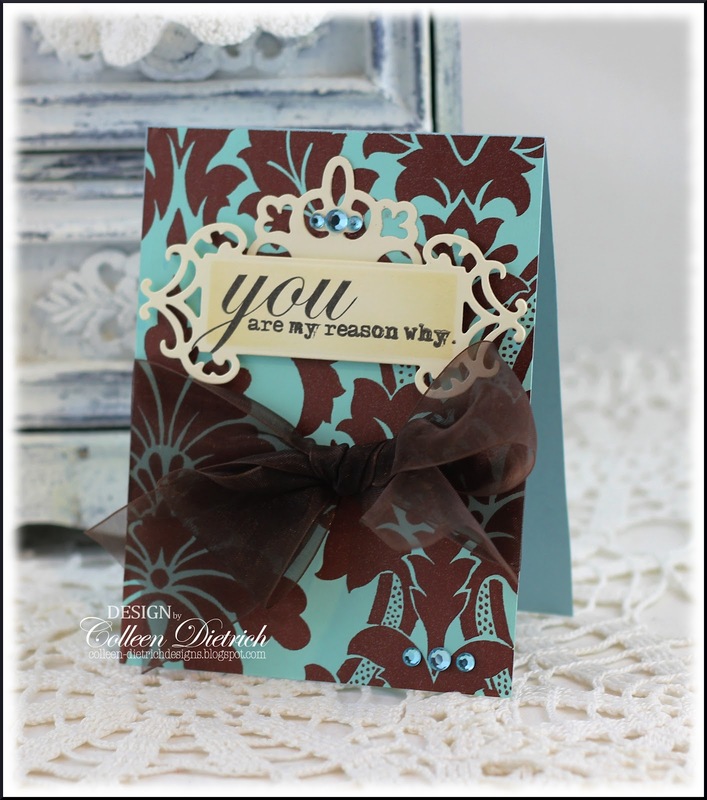 your card is so lovely, so elegant--wow :) thanks so much for playing along with Challenge #4 at A Blog Named Hero!! Elegance seems to be the word for what I'm seeing today, girl! Absolutely stunning! And I LOVE that chocolate brown and aqua combo! Wow, your cards are so beautiful, Colleen! Your tulip is just stunning! Love also the bow and the little pearls! Elegant and classy wow! Thanks for playing with us at A Blog Named Hero! 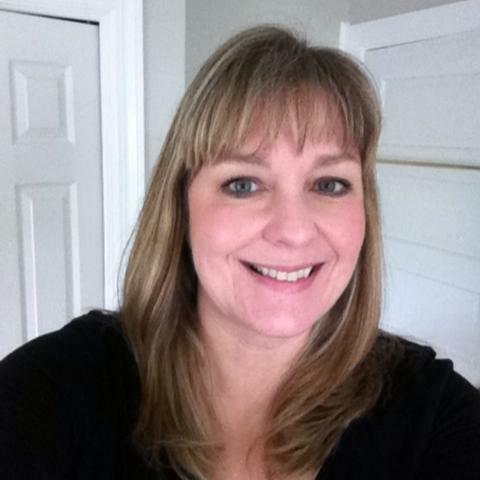 Colleen your work is WONDERFUL! 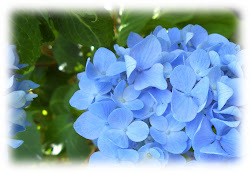 !~ Thank you for joining us in Flourishes Timeless Tuesday! Darn good thing you "needed" to make some art, girl. These cards are so lovely. Congrats on your shout out at ABNH. And for Mr. Rooster too! wow! those cards are beautiful the first caught my eye on the hero arts blog. congrats! Congrats on your win over on the A Blog Named Hero challenge!